No. no. My Sandy gied to me a ring. 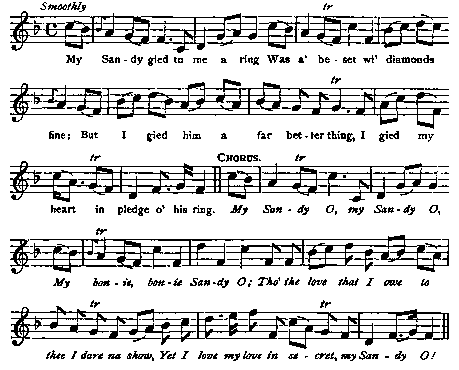 Tune : I love my love in secret McGibbon's Scots Tunes, 1742, p. 4. My Sandy gied to me a ring Was a' beset wi' diamonds fine ; But I gied him a far better thing, I gied my heart in pledge o' his ring. Chorus. My Sandy O, my Sandy O, My borne, bonie Sandy O; Thai1 the love that I owe to thee I dare na show, Yet I love my love in secret, my Sandy O! And I'll keep it till the hour I die.